Will Your Town Win a Chocolate Sign from Cadbury? Comments Off on Will Your Town Win a Chocolate Sign from Cadbury? Cadbury has just announced that one lucky town will be treated to their very own chocolate sign as well as a year’s supply of new Cadbury chocolate for the winner and their family. 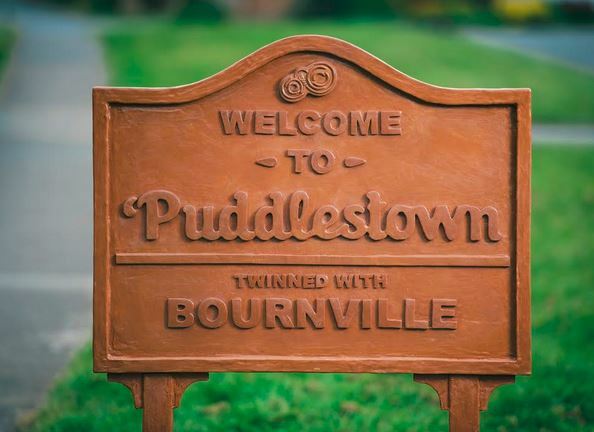 If the activities in Puddletown sparked your interest, and you have a love of chocolate, why not become the most popular person in your town by entering it for a chance to win the new chocolate Cadbury sign. For your chance to win, simply take a selfie in front of any local town/road sign with the designated hashtag #joyofpuddles. Cadbury will then choose the most joyful selfie, via a prize draw, and award the town a personalised sign for one day only. Cadbury Dairy Milk Puddles is available in 90g bars with two fillings, popular hazelnut flavour as well as moreish mint, both surrounded by deliciously creamy Cadbury Dairy Milk – the nation’s favourite chocolate (According to the 2011 census). To view full terms and conditions visit www.promoterms.com/cadburypuddles. For more information on new Cadbury Dairy Milk Puddles find us on Facebook at www.facebook.com/CadburyUK or tweet us at @CadburyUK using #FreeTheJoy.